Established in November 1972, Copper Mountain ski resort is located in the heart of Rocky Mountains of North America just 75 miles (120km) west of Denver interstate and 8 miles (13km) away from Frisco city. Due to its proximity to the nearby airport, and well-established infrastructure, Copper Mountain ski resort is the obvious choice for those wanting a short-term ski holiday. The ski resort has a total of 140 runs across all ability levels. Copper Mountain ski resort is renowned for being focused on creating adventures and fun-filled experiences for its customer ski holidays, rather than being focused on its next real-estate development project. Colorado—North America Is famous for its diverse geography; ranging from arid plains and meadows, desserts with huge sand dunes, granite rock formation, lush forests, alpine mountains, rivers, lakes and much more. Copper Mountain ski resort, has some of the finest family attractions, parks, outdoor adventures and other fun-filled activities, which means that this place has something for everyone throughout the year. It is certainly a winter paradise and a summer getaway, where you can enjoy skiing in winters and a playground for hikers and mountain bikers along with other adventurous activities in summer. Undoubtedly, Copper Mountain and skiing resort is an ideal holiday destination for people anticipating to have a lot of fun on the tracks, in the resort, in the adjoining scenic areas and elsewhere. It is best known for its naturally divided terrains, peaceful snow-cloaked meadows, and woodlands, allowing skiers to have fun in the mountains at their own pace. Moreover, the resort provides a comfortable and laid-back atmosphere, which attracts visitors, extreme sports enthusiasts, and adventurists from every corner of the world. So, it wouldn’t be wrong to say that it offers some of the finest overall experience in entire North America and that’s exactly why people prioritize planning their ski holidays to Copper Mountain ski resort more than anyplace else around. Copper Mountain skiing resort is home to some of the finest skiing runs in entire North America as it offers diversity in pistes, trails, slopes, and trails. An elevated drop of nearly 2601 feet (793m) adds an immense pleasure to the entire skiing experience, especially to intermediate, advanced and expert level skiers ready to try difficult routes to reach the bottom. Plus, it provides an irresistible skiing experience to all sort of skiers as the resort’s tracks are beautifully crafted and designed to perfection. Copper Mountain ski resort is a perfect source of inspiration to amateur skiers and snowboarders, where they can learn the art of the game on lower (and flatter) grounds, before taking on tough or advanced level skiing runs or routes. With a staggering 21% of easy level pistes or runs, beginners can expect to have a lot of fun on tracks the entire day and learn the art of the game before stepping onto advanced or pro-level runs or routes. The skiing courses for amateurs are delicately designed to make them enjoy more and give them a wonderful skiing experience throughout their stay on pistes. Beginner level runs usually marked with green colour provide a wide and moderate inclination to prevent amateurs from falling on the track. Nearly 25% of the slopes on Copper Mountain are marked with blue, meaning they are considered as intermediate level pistes and runs. These runs are specially designed for those beginner skiers who dare start challenging themselves to conquer steep slopes and runs. When and an ideal snowfall hits throughout the winter season, the courses in Copper Mountain becomes relatively remain dense. This means that the beginner skiers have to be comfortable manoeuvring while maintaining adequate speed and balance while going through the crowds. It is a perfect skiing destination for experienced and skilled level skiers, and snowboarders with 54% skiing run, dedicated to them. Having a reputation of providing best advanced and pro level skiing runs, Copper Mountain sking resort is also home to state-level and international skiing, hiking and mountain biking competitions. Competitions which are regularly live-streamed across different media channels. Besides black marked pistes, it also has unmarked pistes off the skiing course, which only daredevils tend to try. 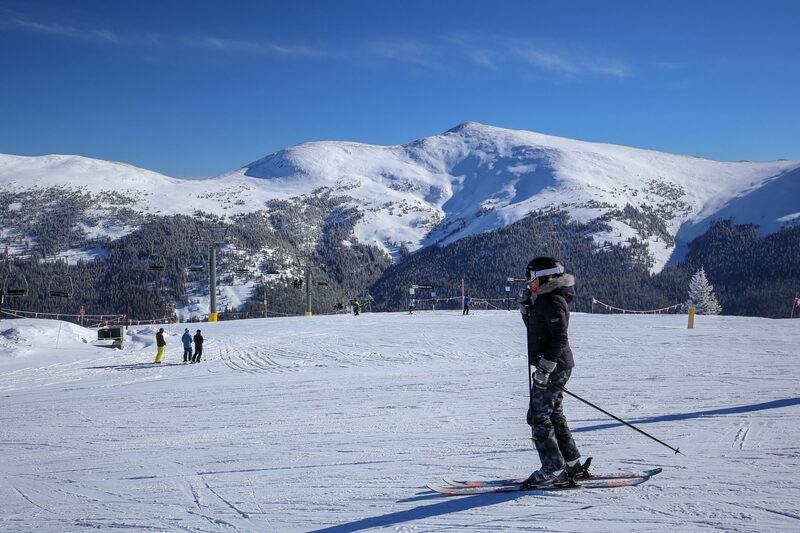 Copper Mountain—a Visit worthy Skiing Resort For All Ages and Abilities! The resort’s amazing snow-records and ever-improving infrastructure entice people, extreme sports enthusiasts and athletes from all across the globe, especially from Europe who are always looking for options to spend their holidays or adventure trips. Besides offering some of the finest mountain and skiing experience, Copper Mountain ski resort is home to some of the finest restaurants, cuisines, bars, clubs, cultural heritage and old-fashioned construction. In short, it is a place where you can have quality time with your friends, family, colleagues and adventure gang and make wonderful memories. No doubt, Copper Mountain ski resort is a must-go place as this place also has impressive views from the top, and offer certain unique sights, which only skiers can sum up well. From traditional après-ski bars to live music venues to crazy dance lounges, something is going on every night in and around Copper Mountain skiing resort. While you may not experience a heavy late-night party scene in Copper, you will still find plenty of music, dance, beer and appetiser deals in the resort. Some bar even offers excellent live music with an exquisite ambience, and exotic drinks, wine, whiskey, which will help you relax after a busy day on slopes. Having a nightlife that is relatively tame doesn’t mean you won’t find next-level party scene in entire Colorado. You can find extreme-level music and entertainment in the East and Central villages in Colorado. Although it is true that the visitors coming from Europe may not find the level of party or excitement as vibrant as back home, doesn’t mean that American après-ski offers anything less than those crazy post-skiing parties, and people here do not know how to end their day on a high note after a hard day on the bumps. From enjoying a quiet evening at a cozy bar with friends to exploring new people in the restaurants and Wine, Beer bars—tourists can enjoy the extensive nightlife in and around Copper Mountain Skiing resort. This place is probably one of those places in Copper, where you can enjoy beer, live music, food altogether after a long and busy day at the slopes. Moe Dixon, a very famous local musician, keep the adrenaline going and heart pumping and make people dancing on the tables, especially when he covers John Denver and Jimmy Buffet on tourists’ recommendations. You can expect to have a lot of fun after a spectacular day at the slopes and enjoy your favourite wine and exotic drinks with your friends, family and adventure gang. The reason why it is the most visited place in Copper is that it offers a unique and pleasant atmosphere that invites young and vibrant crowd; skiers, tourists and sports enthusiasts looking to relax after a busy day on the pistes. This place is another vibrant late-night hotspot in Copper Mountain. It is home to some of the most exotic Whiskies, craft beers, Wine, and cocktails. It is one of those bars that keeps its doors open till 2 am and provide a cosy atmosphere with custom cocktails and drinks. High Rockeries Whiskey and Wine bar occupancy rate is near to 100%, which means there’s a continual influx of visitors that may keep visitors waiting for long. This bar has installed 9HD TV’s, which live stream NFL matches during the season every day from 3-6. Incline bar is a favourite hotspot right at the bottom of the American eagle lift that attracts a relatively younger crowd. This place offers custom-made drinks, whiskeys, wine, which you will find nowhere else in the entire Copper. This is surely a worthy visit place! Nothing can beat this restaurant as this theme-based bar offers 17 beers on the tap and has authentic flavours and tastes that cheer tourists to have more and more. The music in the background feels good to ears and helps you enjoy a lot and make memorable moments more beautiful with this serene ambience. This place is relatively quieter than most bars around, which means it is ideal for elderly and middle-aged people. So, if you are planning a trip to Colorado, then you should visit this place and have fun with your friends and family. Here you will find a great classic and vintage-type music scene in the resident band and Lefty Lucy. Both of these bands will have you dancing regardless of how much you skied during the day or how tired you may be. Besides live music act, it also offers some of the finest meals and deals on the menu along with exotic drinks; wine, beer, and whiskey; which would provide well for your late evening excursions. The North American Colorado Mountains are home to some of the most beautiful ski resorts in the entire world, like Copper Mountain, which offers an endless list of activities and outdoor adventures. Undoubtedly, Copper Mountain ski resort has its strategic geographic importance and has a rich cultural heritage and history. From sightseeing to outdoor sports activities to traditional food and drinks; it has it all. This spectacular resort keeps the adrenaline going and the heart racing, as it offers tons of different non-skiing activities to keep everyone busy. Throughout the year, Copper Mountain ski resort offers endless outdoor activities to visitors and unparalleled scenic beauty-- all with a little touch of excitement. From visiting Colorado state parks, wildlife views, national parks, to adventure in lakes, rivers, and air, it offers a unique set of activities to evoke the interest of people looking to have fun in their way and pace. Here is the list of non-skiing activities, which will surely help you enjoy the most out of your stay in Copper Mountain skiing resort. To see Colorado Mountains from an entirely different perspective, you must ride in a hot air balloon for some spectacular scenic views. Nearly every major city, towns, valleys, a vast expanse of prairie grasslands can be seen from the top, which would amply your experience and helps you remember the splendid beauty of Colorado Mountains from a bird’s-eye view.